Premium Black Gladiators are a variant of the Black Gladiator Ocellaris where the first and second bars are connected barring on at least one side. Unlike snowflake barring, the stripes of a Gladiators have smooth edges. 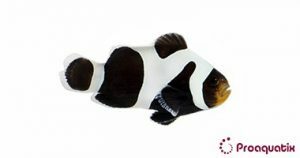 Like all clownfishes, Amphiprion ocellaris is a sequential hermaphrodite. The largest individual present will exert dominance and become reproductively female. The next largest fish will become reproductively male. Remaining smaller individuals are usually tolerated but will not be reproductively active.